High Octane Brands | PokerRun.org: a nonprofit organization helping other nonprofits organize and manage their Poker Runs and other fundraising charity events. Poker Runs are an increasingly popular fundraising event amongst many organizations, ranging from healthcare and human services to youth sports organizations. 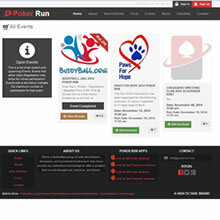 PokerRun.org was established by Mainspring Charities as their world facing fundraising arm which needed to facilitate the planning and execution of events on multiple dynamic scales. A web site and commerce solution was needed that was intuitive, robust, and streamlined. Utilizing a vast amount of consumer research we were able to develop a sense of the needs of individuals as well as organizations. This allowed us to create a web site that is a mobile first design, with a custom eCommerce solution, that maintains it's usability independent of the platform from which it is viewed. Simultaneously this allowed us to create a seamless experience with their existing mobile applications and further the brand's identity. An integrated mobile application suite that combines the robust functionality and interactivity across all platforms while maintaining a simplicity of use and straight forward processes.